Our eye wash relieves irritation, discomfort, burning, stinging or itching by removing loose foreign material, chlorinated water, smog and pollen. Ingredient: An isotonic buffered solution containing sodium chloride, sodium phosphate dibasic, sodium phosphate monobasic, and edetate disodium preserved with benzalkonium chloride in purified water. USP. 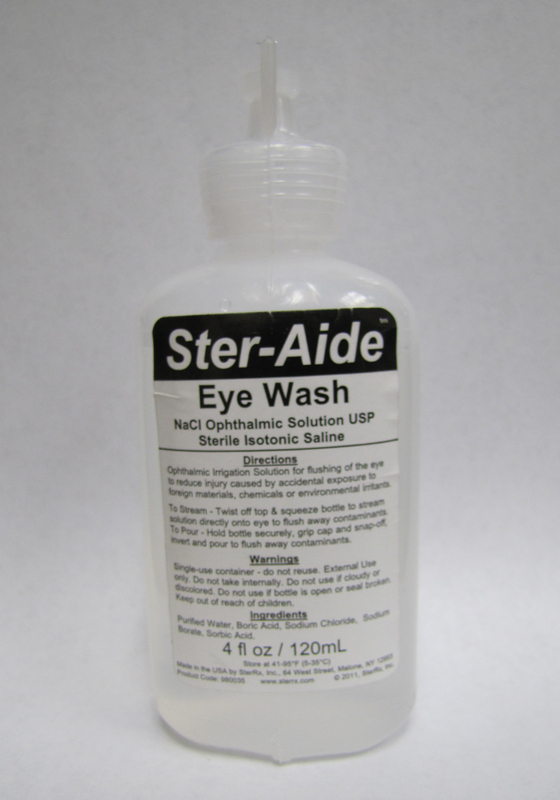 Eye wash, twist top, 4 oz. Salinaax eye wash helps flush loose foreign material, air pollutants and chlorinated water from the eye. It helps refresh irritated or tired eyes. Ingredients: A sterile isotonic buffered solution containing potassium phosphate monobasic, sodium chloride USP, and sodium hydroxide preserved in purified water. 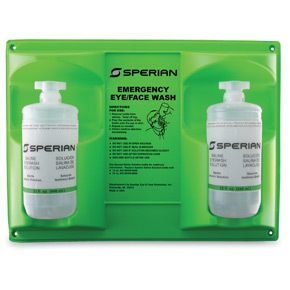 In an eyecare emergency, you need an eyewash product you can count on. Fendall's EyeSaline® single-use bottles feature twist-off caps that are tamper-resistant, yet easily removed in an emergency. No seals to remove and no leaky caps. Sterile, buffered isotonic saline solution has 36-month shelf life. Our eyewash relieves irritation, discomfort, burning, stinging or itching by removing loose foreign material, chlorinated water, smog and pollen. Station holds two bottles of eyewash.